Former Dallas Cowboy Deion Sanders has filed a police report saying his estranged wife attacked him in their Prosper home. Pilar Sanders was booked into the Collin County Jail on Monday night on suspicion of assault family violence, a Class C misdemeanor. Police were called to the Sanders home shortly before 6 p.m. for an alleged domestic dispute. 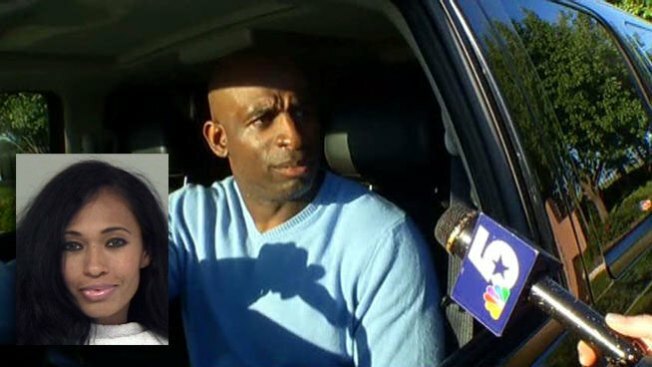 "My kids, they are scared for their life," Deion Sanders told NBC 5 as he was leaving his house Monday evening. "They just saw two women jump their dad in his own house, in his room, in my room. It's sad." The NFL Hall of Famer told police his estranged wife, Pilar, walked into his bedroom and attacked him. "I got locks on my doors right now," he said. "Is somebody going to have to die? Is it going to be me before the court does something and get this woman out of my house? It's absurd." When asked if he was hurt in the incident, Sanders said: "She tried to bite me when I was carrying her out of my room, but my son was pleading to her get out of the room and leave me alone." Sanders said he believes his estranged wife belongs in jail. "She's got to go to jail," Sanders said. "I hate it because it's my kids' mother, but it's not even the same person, and my sons witnessed this whole thing. They had to fill out the police report and tell the police what went down." Sanders filed for divorce from his wife in December. In February, she filed a lawsuit seeking $200 million in damages for what she called slanderous comments that were posted online. He posted a picture on Twitter of he and his kids filling out police reports, that photo was later removed. "Strength is not only based on what u can lift,pull,push,carry,hold or squat. Its also measured by WHAT U CAN WALK AWAY FROM! TRUTH"
Pilar is expected to have two hearings Tuesday, one for the assault charge and another regarding an emergency protective order filed by Deion to keep her away from him and their home. Pilar Sanders' bail is set at $264. She is currently being held in an infirmary at the jail, in isolation, after refusing to take a tuberculosis test that is required before entering the general population. Pilar's attorney, Larry Friedman, said Tuesday morning, "As much as there is to say, I am prohibited from discussing the case at this time. However, you know that there are two sides to every story. The truth will come out in court. Be patient."